“Bold Block – Love Hand” is stamped on polymer clay, baked and painted (the two outside blocks). 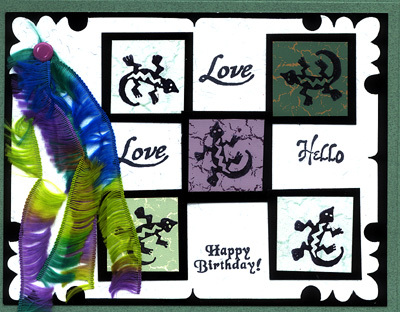 The center block is stamped on card stock, colored with markers and has a rhinestone glued to it. 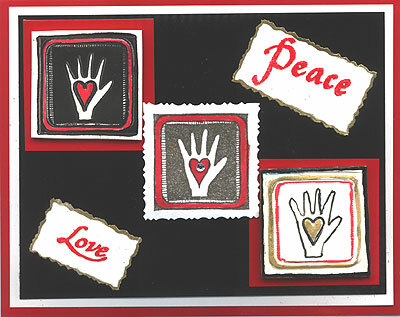 The word stamps, “Love” and “Peace” (a discontinued stamp; e-mail for availability) are stamped with a Rocket Red Brilliance pad, embossed with red embossing powder and cut with deckle edged scissors, then edged with a gold Krylon Leafing pen. The layering is done with red, black and white glossy card stock. Card by Susan Frank and Margaret Wiggin. “Love” is gold embossed three times on a rectangular piece of kaleidoscope confetti card stock which has been edged with a gold Krylon Leafing pen. “Bold Block – Love Hand” is gold embossed on black card stock, cut out and placed on a second rectangular piece of kaleidoscope confetti card stock which has also been edged with gold and the “Love” stamp embossed in gold. 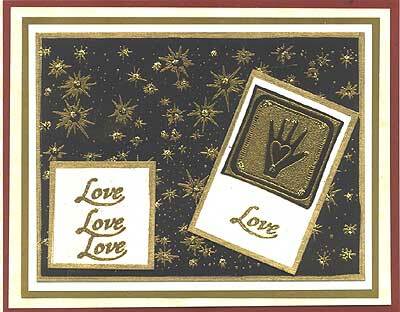 These two pieces are layered over a black piece of card stock which has been embossed in gold using “Starburst Background.” Gold glitter glue is applied in the center of each star, on the fingernails of the hand, at the base of the heart, and in the corners of the Love Hand image. The black card is edged with gold and layered over four layers of card stock in the following order: (1) white, (2) gold, (3) ivory and (4) rust. Card by Margaret Wiggin.